All Dressed Up Challenge Blog!! The theme is Christmas and I chose to use Little Angel by Wendy Burns. This sweet image and other digi's are available at All Dressed Up Stamps Store. Little Angel is colored in Copics and I used the paper pad Winterland by Fancy Pants Designs. There is Shabby White Frantage around her and glitter in her head piece. I used memory box Precious Snowflakes die and cut off the ribbon to use as snowflakes. Part of the paper is about snowflakes and I saw this piece and made a banner out of it. Since she is called Little Angel I thought I should add a Angel charm to the ribbon. Here is the inside all made with paper from the Winterland paper pad. I hope you enjoyed my card and go over to All Dressed Up Challenge Blog and join us to win! Love all the Frantage you used on this gorgeous card! Such beautiful colors and that bow is WOW! Sensational card! This is beautiful Kelly. The image is so cute and I love the frantage and snowflake dies. The green and peach looks gorgeous. All so beautiful Miss Kelly!!! Great coloring and fabulous layers. Congratulations on the guest DT. They are lucky to have you! Lots of talent here!! She's so sweet - and such lovely colours... that delicate teal is so pretty. Huge congrats on your Guest Spot - they're in for a fabulous month!! Your card is absolutely precious! I love the image! And the fran-tage around the the image. By the way...how do you do the fran-tage thing? She is such a precious angel - I think Marilyn just used her too. How lucky they are to have you as a guest DT! Such a beautiful card and the coloring is fabulous! Love all your little details! Awww, Kelly... she's gorgeous! Your shabby chic/vintage style really shows this image off so well. Love the Frantage too (in my head, I always call it 'the F word'!). Perfect for those of us who love it so much! WOW........absolutely gorgeous!!!!! I almost missed this one! When you're off the computer for a day, it's amazing how much you miss! 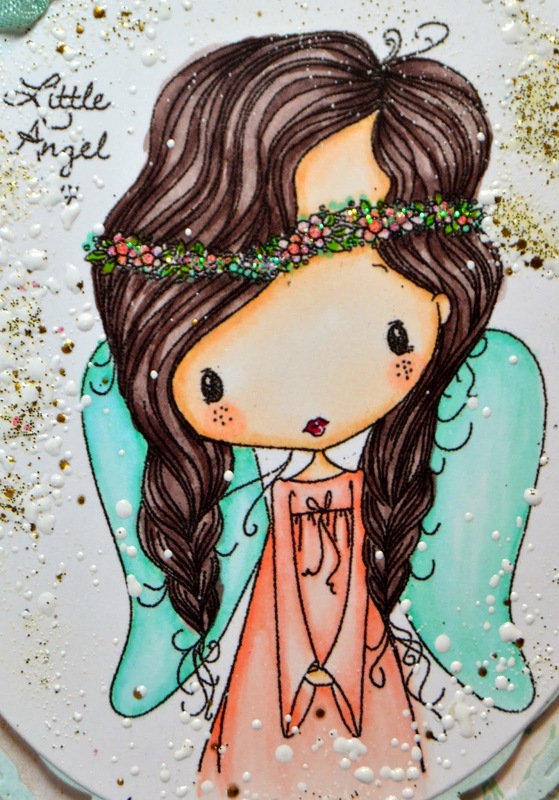 Outstanding coloring of this sweet angel and fab details, Kelly! Congratulations on your GD spot!